Explanation: Stars are forming in the Soul of the Queen of Aethopia. More specifically, a large star forming region called the Soul Nebula can be found in the direction of the constellation Cassiopeia, who Greek mythology credits as the vain wife of a King who long ago ruled lands surrounding the upper Nile river. The Soul Nebula houses several open clusters of stars, a large radio source known as W5, and huge evacuated bubbles formed by the winds of young massive stars. Located about 6,500 light years away, the Soul Nebula spans about 100 light years and is usually imaged next to its celestial neighbor the Heart Nebula (IC 1805). 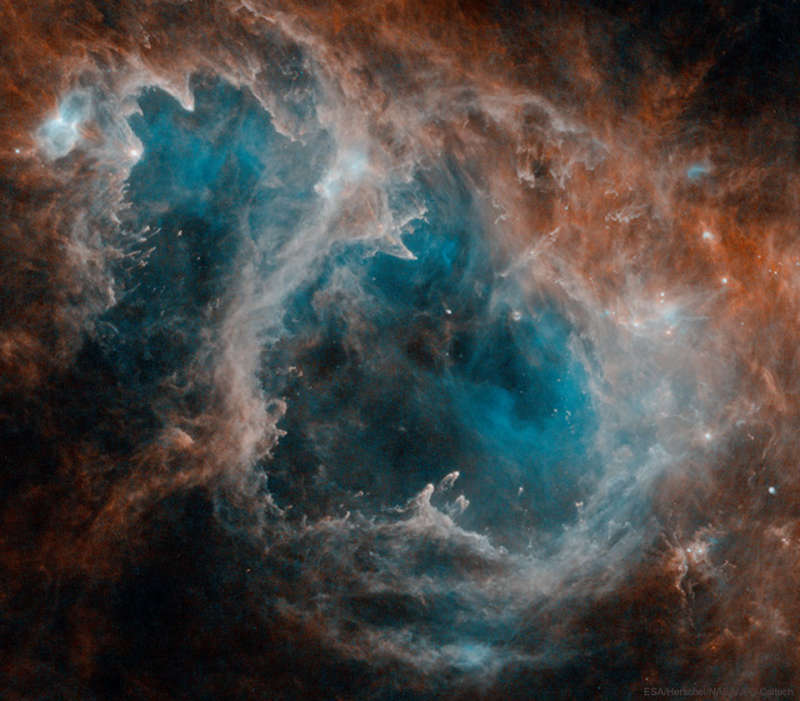 The featured image, impressively detailed, was taken last month in several bands of infrared light by the orbiting Herschel Space Observatory.